Tea Time Placemats, a Judy Niemeyer, Quiltworx class. 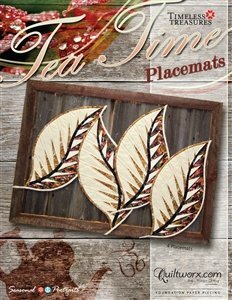 These Placemats are cute, fun, small, fast, and striking, these little leaves are sure to impress at any tea time gathering! Quiltworx.com completed four placemats, complete with quilting, in less than a day. These also use our newest paper piecing technique, called Curved Paper Piecing, to add the vein element of the leaf. With a simple binding around the shape of the paper pieced element, these little leaves can be hung on a wall in a collage, or placed on a table as a feature element. I am a military wife, married to James, with 3 grown children and 8 grand kids. I live in Longview, Washington. That is about 2 hours south of Seattle and 1 hour north of Portland, Oregon. I have always had a passion for crafting of any kind, but never thought of myself as a quilter, my sewing machine had never left my closet except to sew scrapbooking paper. With some nudging from a friend and after winning some extra play money at bingo I enrolled in my first quilting class. That led to working in the quilt shop 6 months later. After trying traditional paper piecing a few times, I had my “AHA” moment when I found Judy Niemeyer’s quilts. I instantly fell in love with the step by step directions, well laid out diagrams, and the gorgeous results every time. Price includes 2 days instruction with Quiltworx Certified Instructor Melanie Castle.